I'm a former U.S. Marine and current SWAT commander. I've chased devils with the U.S. Marshals Gulf Coast Regional Fugitive Task Force, operated over 25 years in the chaos of critical incidents, and have even contemplated the deeper meaning of life. In my chosen profession you reach an age where you can no longer sustain the demanding operational tempo required, so I've chosen to write based on a little life experience, imagination, and because carpal tunnel seems challenging. I enjoy carpentry, handyman activities, the outdoors, and spending time with family. I'm looking forward to simpler times in the future and currently live in Birmingham, Alabama. Yes, I love football. The author infuses a strong spiritual atmosphere into the narrative and makes readers feel as though they were experiencing the power of God, personally and physically. The writing is polished and it flows with unusual fluidity. JM Myrick has the gift of plotting and I enjoyed the intricacies in plot development, the surprises, and the sudden turns the reader experiences in the ride. The story is crafted to read like a thriller. The themes of war, terrorism, political machinations, and religion are crafted skillfully into the narrative. But it is the way that the author gets readers to experience an encounter with God that caught my attention. 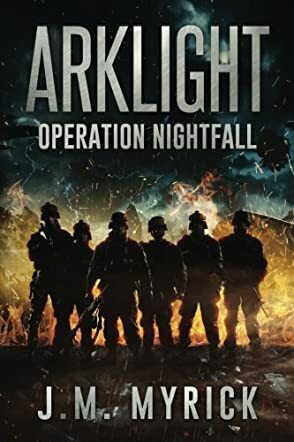 Arklight: Operation Nightfall is as inspiring as it is entertaining; a brilliant story.